We hope you are still rested up from our relaxing Spa Day the other week and hope to see you all Friday for our next great meeting. The breakfast sheets didn’t make their way around, so if you sit at the Black or Purple table, please bring something to share with the group. 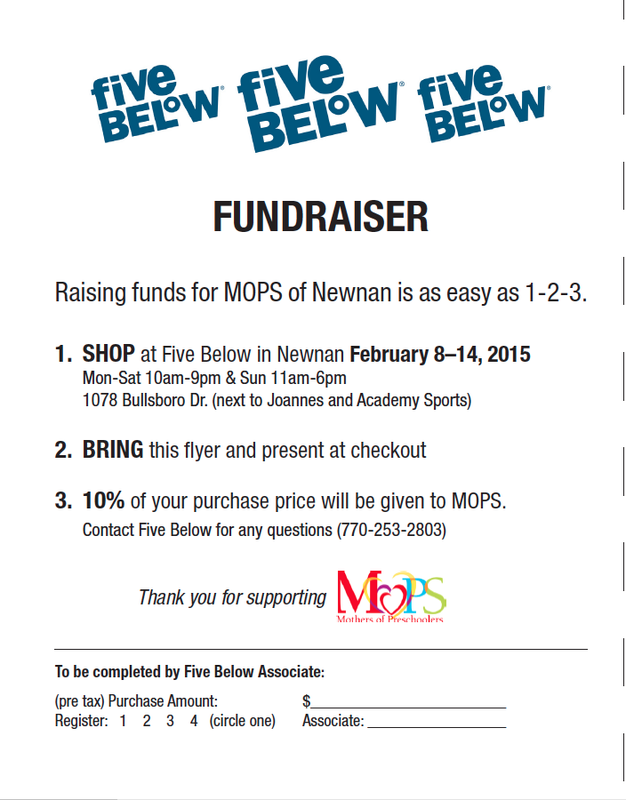 You can pick up copies of the below flyer at MOPS on Friday or print this flyer to hand into the folks at Five Below (you must give Five Below the flyer for MOPS to get credit). Please give these out to friends and family to help raise funds for MOPS! I am always looking for ways to sneak veggies into my children’s food. After having this recipe in my “to try” folder on Pinterest for months, I decided to make these hidden spinach muffins. They were not only easy, they were gobbled up by my very picky 6 year old! Heat the oven to 350 degrees and coat 16 muffin cups with cooking spray. In a large bowl, whisk together 1 cup all-purpose flour, 1 cup whole wheat flour, 3/4 cup sugar, 2 teaspoons baking powder, 1/2 teaspoon baking soda, 1/2 teaspoon salt, and 1 1/2 teaspoons cinnamon. In a blender, puree 1/4 cup canola oil, 3/4 cup milk, and 6 ounces (6 cups packed) fresh baby spinach until smooth, then blend in 1 large banana and 2 teaspoons vanilla. Fill each prepared muffin well two-thirds full. Bake the muffins until a toothpick inserted in the center comes out clean, about 18 minutes. Thought for the Day: Temptation is an invitation to meet my needs outside the will of God. Satan’s very name means “one who casts something between two to cause a separation.” He wants to separate us from God. One of the subtle ways he does this is to raise doubts in our mind about whether or not God will meet our needs, if God is truly enough. Satan wants us to feel alone and abandoned so that we turn to his offerings instead. Temptation of any kind is Satan’s invitation to meet our needs outside the will of God — through material things, chasing significance and approval from others, or excessive physical desires. It’s what causes a woman on a budget to set off on a spending spree. She feels the thrill of the purchase in the moment. But shame creeps in as she hides the telltale shopping bags from her family. It’s what pulls at the businesswoman to work harder and longer and refuse to build boundaries in her schedule. Always chasing that next accomplishment or that next compliment — but it’s never enough. It’s what sent me on many eating sprees. The kids were loud; the house was messy; the demands of life felt beyond my control. So with great justification, I’d indulge only to end up with a bloated stomach and a deflated heart. We expose this subtle message sold to us by Satan when we break it down to distinguish the difference between a need and a want. All of the examples I just described are wants, not needs. Intellectually, we understand the definition of each of these words, but oh how Satan wants us to think they are one and the same. When the difference between these two words starts to blur, we are on the road to compromising. We start justifying. And it sets us up to meet our needs outside the will of God. The abyss of discontentment invites us in and threatens to darken and distort everything in our world. Remember, Satan is a liar. The more we fill ourselves with his distorted desires, the emptier we’ll feel. The more we overspend, overwork, or overeat, the emptier we feel. Satan wants to separate you from God’s best plans. He wants to separate you from God’s proper provision. He wants to separate you from God’s peace. God’s provision sustains life. Satan’s temptation drains life. God’s provision in the short term will reap blessings in the long term. Satan’s temptation in the short term will reap heartache in the long term. God’s provision satisfies the soul. Satan’s temptation gratifies the flesh. That’s a promise. Trust God. Embrace truth. Live His promise. Dear Lord, I am reminded once again of how dangerous temptations are, because they invite me to meet my needs outside of Your will. Keep me from compromising and from justifying today. I know that only Your provision sustains life and satisfies my soul. I want this truth to ring loud and clear throughout my day today. In Jesus’ name. Amen.